The new year has kicked off with a significant rise in house prices. For the latest 3 months to January, the median sale price of houses sold across Devonport rose to $1,820,000 from $1,600,000 last month. This rise heralds some degree of a recovery in prices that had been weak though the greater part of 2018. As a typical quirk of statistics though, this month-on-month rise actually represents a 14% fall when compared to the same time last year. This is due to a significant spike in prices at this time last year. Next month’s report will be key to see if this January result is also a one-off spike or represents a strengthening of prices. The above chart shows the tracking of median sales price for houses based on 3 months aggregated sales. By comparison the chart below which tracks 12 months aggregate sales results provides a longer term trend perspective on sales price of houses sold in Devonport over the past 5 years. This better shows the degree with which the local property market saw price adjustment through 2018 and then the small inflection from the latest data to January. The general state of the market remains well balanced with strong levels of new listings providing good choice for eager buyers of which there are plenty in the market as seen from strong open home numbers. A total of 62 new properties were listed in the past 3 months, that compares with 57 at the same time last year. However, when you do the comparison with this time last year, the available stock of properties for sale was just 38 whereas at the end of January this year it was considerably higher at 57. Through the first few weeks of February this has grown even more to reach 75 properties by the mid month. With this strong inventory it is not surprising that buyers have a degree of leverage, given the options that the market provides. Sellers clearly need to manage the sale process smartly with their agent to maximise the emotional attachment that can arise in the early marketing period, well before those buyers get too distracted by the latest ‘shiny’ new listing. Looking at the trend analysis of sales and prices it is clear as detailed in the chart below that when viewed as the year-on-year change the volume of sales lags behind last year as does prices, although both are showing signs of recovery. Sales volume of houses through the past 3 months was down 11% at 35 sales set against 49 new listings, this has pushed out inventory levels to 48 as compared to 45 at the end of December which is not a huge change and demonstrates that activity levels are still good in the market. Whilst sales volumes year-on-year are down, so too is the median selling price down 14% as compared to this time last year, although as stated earlier there was an unexpected peak in median sales price at this time last year which could be somewhat misleading. A somewhat brighter spot on the property market is the resurgence of the market for units. Whilst a small segment of the market; this segment has languished for over a year with declining sales and prices, however the latest 3 months shows early signs of a resurgence with volume up and median prices up as compared to this time last year. A small but significant recovery in median sales price of investment and owner-occupied units needs to be seen in perspective as the chart below shows as it tracks the median sale price over the past 5 years. At the latest level fo $772,500 unit sale median prices are still well down on the last peak of the market over two and a half years ago in mid 2016. I thought it would be of interest to review the past 12 months, and provide a longer term perspective of the Devonport property market, something I look forward to doing regularly in future years - who knows how things will look 12 months from now? So, some top line numbers. During 2018 some 196 properties were transacted across the Devonport peninsula (Devonport / Narrow Neck / Stanley Point). Of these the vast majority were family homes (149 or 76% of the total), a further 27 Units were sold with 10 Apartments and 10 Townhouses. When compared to prior years, transactions levels were low. At 196 sales, this total was only the third time in the past 26 years that sales have fallen below 200. In terms of property prices; the median price for all the sales in each of the calendar years of the past 26 years shows a predictable rise over the long term as seen in the chart below. However the median sale price for all sales in 2018 fell from a year earlier at $1.51m, down from the record high of $1.64m in 2017. The 196 properties sold in 2018 added up to a total sales value of $348 million. The single highest sale price was $10 million and the lowest recorded sale price was $465,000. The following analysis highlights the top 10 streets of Devonport by the measures of highest average price (this is limited to streets with 3 or more sales in the past year), the total sales value of all property sales and the streets with the most sales. By reference the most active streets in Devonport by measure of the number of property sales over the past 15 years are in order: Stanley Pt Road (the Devonpark apartments certainly influence the total), Vauxhall Road, Ngataringa Road, Lake Road, Victoria Road, Church Street, Aramoana Avenue and Calliope Road. Based on this comparison it looks like Queens Parade has been especially active in the past year with 3 sales of units at number 16 contributing to the overall sales. Ewen Alison also has been more active, with 7 sales comprising a couple of sales of units and the sale of number 24 twice. At the same time Calliope Road with just 4 sales was a surprising omission from the Top 10 streets for sales for 2018. With 75% of all sales in Devonport being family houses it is always appropriate to examine this sector in isolation given the largely uniform nature of this housing stock with such a strong heritage component. A total of 149 houses were sold in the past year in Devonport with a total sales value of $294 million. Just as with overall property sales this total is the 3rd lowest since 1992. Just as the median sale price of property in 2018 showed a fall from a record high in 2017, so it is with house sales. The median sales price for houses fell from $1,750,000 to $1,670,000. However this still represents a more than doubling in median sales price compared to 10 years ago when the median sale price of houses in 2008 was $800,000. The month of December can surprise many people who sense that people are far more occupied with Christmas plans, parties and the fast encroaching summer holidays, than buying and selling property. The fact is that transactions are often made right up until Christmas eve and this year proved no different with 14 sales completed before Christmas; 5 more than sold in December last year. Despite this slightly more active December, the final 3 months of 2018 saw sales volumes 9% down compared to 2017 with 41 transactions. Adding to this lower level of sales was a higher level of new listings, with 75 properties brought to market in just 3 months which kept inventory levels over 50 for the third report in a row. Just by comparison there were 32 properties on the market at the end of December last year. Sales volumes tend to track ahead of prices and as with lower sales volumes over the past 3 months so prices have continued to ease. For sales in the final 3 months of 2018 the median sale price at $1,400,000 was down 16% compared to the same time last year. 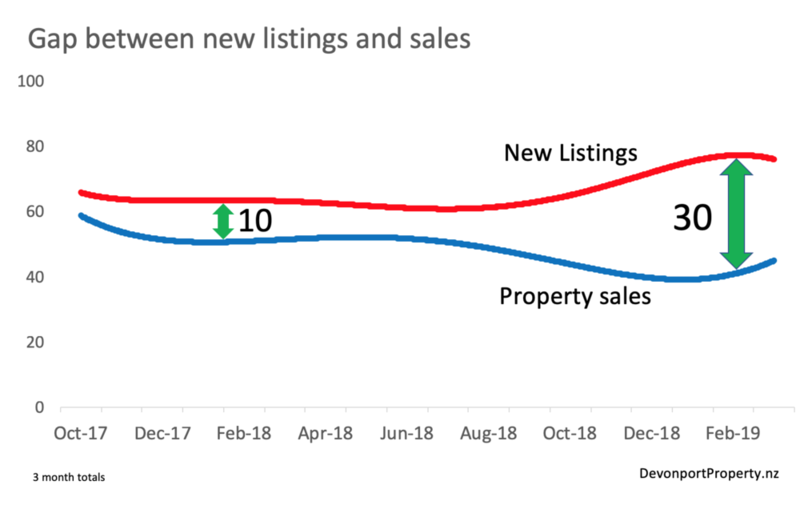 As the chart below shows the market continues to track below last year in both sales volume and prices as it has done since early spring, although sales volumes look to be edging back somewhat. Just 29 house sales in the final 3 months of 2018 as compared to a surge of 60 new houses coming onto the market demonstrates the state of the Devonport market which at this time certainly favours buyers. Adding to this a median price which is looking very stable at around $1.6m which should offer incentive for these buyers active in the market. The comparison of median sale price with this time last year showing an 11% decline is a little bit misleading and will be again in January as the market last year hit an unexpected spike when median sale prices for houses topped $2m before falling back through the first half of 2018 to a more normal level. As has long been commented in prior reports through almost all of 2018, the market for investment and owner-occupied units has been subdued with volumes and prices below prior year, however the market seems to be definitely adjusting. Whilst volume sales in the last 3 months still show a decline, the scale of that decline has slowed to just 4%. The chart below shows the trajectory is likely to see sales return to growth in the start of 2019. As for sales prices the median price in the final 3 months of last year continues to show a decline, down 16% at $760,000 but there are signs of strengthening when seen as a tracking chart of median price over the past 5 years. Spring is the most active period of the property year and no single month is more active than October. This year is no different with a very high level of new listings come onto the market. What is unusual and significant, is the slow-down in sales volumes. This fall-off in sales now places the local Devonport market firmly in the category of a ‘buyer-market’. There’s ample choice for buyers, who now wield power to select and negotiate; this presents a significant challenge for sellers as the competition for buyer attention is tough and their negotiation power is slipping away. Over the past 3 months, 77 new properties have come onto the market. This has been offset by a sales total of just 40 properties, pushing available inventory to the highest level of the year – at the end of October buyers had a choice of 57 property options from which to choose. By comparison at this time last year buyers had just 37 properties as options to buy a rise of 50% in available inventory. Sales volumes which had held up well through the winter months showing single digit percentage increases through the first half of the year, have now slowed significantly with a fall of 9% compared to the same time last year. The specific sector of the market made up of family homes as separate from units and apartments is not immune from this change in the market. Sales volumes are down 6% with just 29 sales of houses in the prior 3 months, well down from a figure of 51 in the final months of autumn, showing clearly how much the market has slowed. 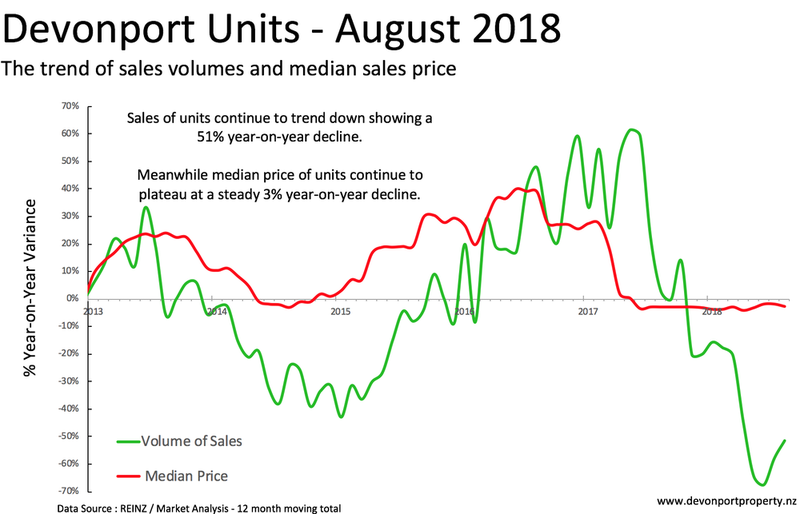 As the sales volume has slowed, so has the median price which whilst stubbornly refuses to decline, remains flat as it has been for the past 3 months. The current median price of $1,600,000 is identical to this time last year, but has fallen significantly over the past 6 months since hitting $1,890,000 at the end of autumn. This segment continues to weaken with sales down 11% and median price down 16%. The tracking of this market for owner occupied and investment properties is now entering its 15th month of consecutive declines with just 8 sales of units in the past 3 months. With 14 new listings ,the market is not denuded of stock however buyer interest appears to be cautious and somewhat picky. The median price over the past 3 months at $730,000 is down by a whopping $170,000 as compared to the peak of the market back in 2016 and at this time shows little signs of appreciating anytime soon. The latest statistics of property sales and prices for Auckland over recent months have continued to show that prices are flat or falling slightly. The September report from the Real Estate Institute showed that across the wider Auckland region the median sales price for all properties was $850,000, no change from a year ago. The volume of sales at 1,616 was down 2.1%. These statistics represents all properties sold by licensed real estate salespeople and include apartments, units, townhouse and lifestyle properties. It is really important when assessing property statistics to examine categories of properties separately as I do for the Devonport market. Analysing the market for just family homes shows the comparison between Devonport, the North Shore and the wider Auckland region in the chart below. 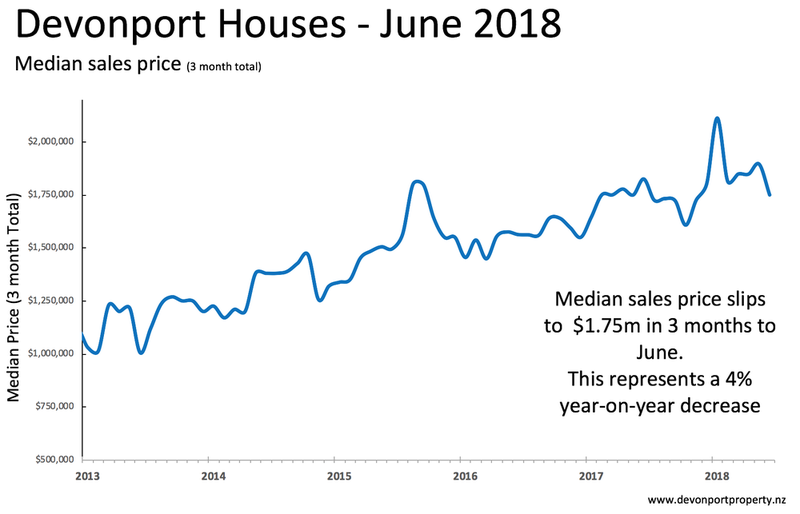 Over the past year the sales of just houses across Devonport totalled 171, a rise of 16% with a median price of $1,750,000 in September up very slightly on the same time last year. Compare that to the North Shore generally and you see that from a total of 2,933 house sales in the 12 months to September, volumes were down 9% and prices have eased back 3% to $1,110,000. Looking to the wider Auckland region, house sales over the past year have seen volume down 2% and prices ease 1% to a median price of $915,000. Taking a view of the key stats for the Devonport market for September. Across all property types, the most recent 3 months (July to September) has seen the local Devonport market with a total of 42 sales, with 54 new property listings hitting the market. This strong selection of new listings has gone some way to providing a greater purchase options for eager buyers in the market. Early indications based on the first weeks of October are showing a a strong rise in the availability of properties for sale and this is likely to continue as the market gets into full gear for Spring and Summer. It is clear that the local market is what would best be described as stable, a state that is in the best interests of buyers and sellers; for whilst homeowners naturally love to see appreciating values the uncertainty this brings makes purchasing decisions more fraught and anxious. In today’s market the key metric is not sales price which is flat, but the volume of sales which proves that properties are selling. The key to these successful sales is not a function of a hot market, but well presented properties and a seller who is realistic to this new static property price market and who understands the different sales process with a greater focus on marketing and negotiation. Whilst the majority of sales across Devonport are houses. One in five of all sales are units, townhouses and apartments. The market for units has been, as previously reported experiencing a significant slump over the past year. There are though, early signs of a pick-up in this sector with 22 sales of units over the past 12 months, which whilst down from the peak levels of 42 sales 18 months ago is an improvement on the bottom of the market 3 months ago with just 15 sales in the preceding 12 months. Prices for units though remain weak with a 13% year-on-year decline to $713,000. A new selection of 23 properties were listed for sale in August, taking the total for the past 4 months to 47 and in so doing helping to raise the available inventory of properties on the market at the end of the month to 42, a significant improvement from just 33 on offer at the end of July. This clearly heralds the start of the Spring property market in a fashion very similar to this time last year. At the same time property sales across Devonport remain steady with 45 properties sold in the past 3 months to August, up 4% as compared to the same time last year. Whilst sales number remain steady, the median sale price based on the past 3 months of sales seems to be in free-fall. 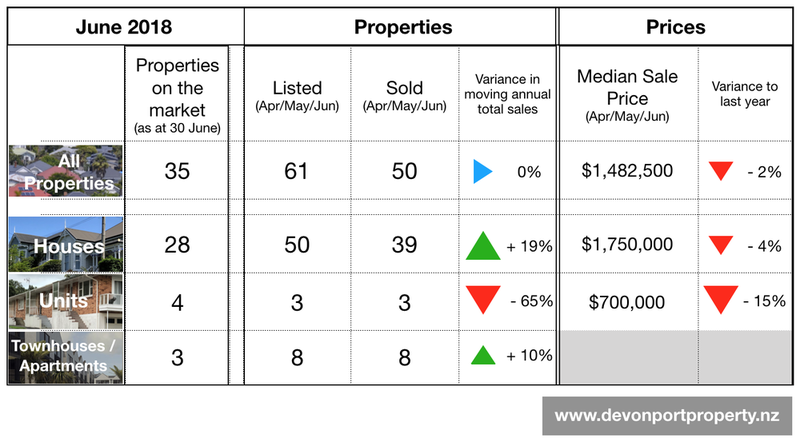 The reality though is that when measuring a small data set as is often the case in Devonport, changes in the composition of the sales can have a significant effect on the median price. By that I mean if in one period the composition of sales of houses is stronger in smaller 3 bedroom villas selling around the $1.5m mark and sales of 4+ bedroom houses is weaker then the median is pulled down, but such a "fall" in median price is not a true indicator of a decline in property prices or values. This is the case in the recent data. Prices have stopped rising and are flat. For this reason I have decided that when it comes to median price data I'm going to rely more heavily on a 12 month moving data set rather than a 3 month moving data set as I have been doing up until now. The only downside of this change is that price movements that are a reflection of underlying changes in value resulting from demand changes in the market will be slower to be seen on the upside as well as the downside. Making this adjustment results in a revised table for August property summary as seen below. In terms of the trends in volume sales and median price a revised chart below shows the 12 month moving total for all property types. What is most noticeable from the chart is the resilience of sales volumes, as median prices have weakened over the past 6 months. In the 12 months to August volume sales have seen a 4% rise whist median prices at $1,545,000 are down just 2%. This segment of the market remains the driving force of the market recording an 18% rise year-on-year with 35 sales in the past 3 months, very close to the level of new listings which totalled 37; continuing to show the tightness of this market which continues to see well presented and well-priced property selling with speed and efficiency, as long as they are well-marketed. 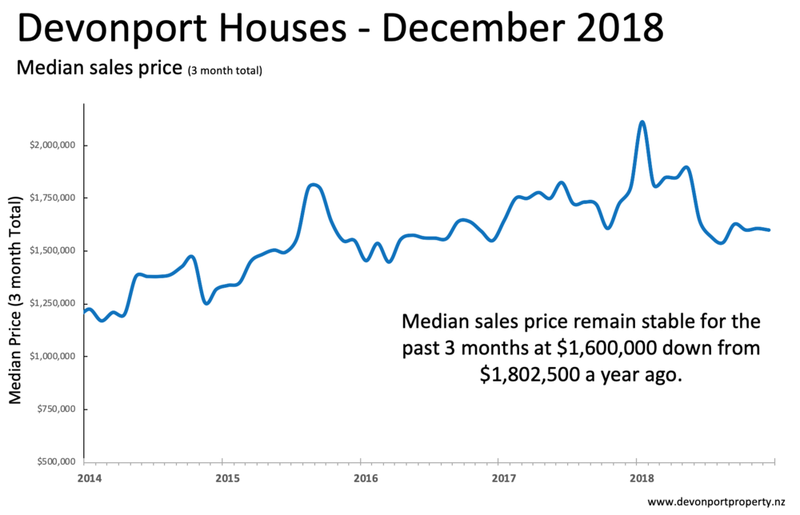 As the trend chart below shows volume sales of houses are strong but prices are flat with a median sales price of $1,760,000 up just 1% compared to the same time last year. There is not a lot of change to be seen in the market for investment and owner-occupied units across Devonport. Sales volume whilst still weak appears not to be falling further, however there is no ignoring how far it has fallen from the situation a few years ago. A total of just 6 units were sold in the past 3 months down 51% compared to this time last year. As for the median sale price, given the quieter level of activity prices continue to remain on a plateau which is trending slowly downward recording a 3% year-on-year decline. At the same time median sales prices continue to edge down albeit slowly at 3% decline vs the same time last year with a median price of $761,250. Whilst our collective thoughts maybe turning to Spring and the hope of warmer weather ahead, the property market has yet to see any significant Spring shoots. There are tentative indications as the level of new listings starts to increase but at the same time strong sales fail to dent the inventory shortage. The real challenge for those thinking of buying is without doubt the current shortage of properties. For the first time in the past year, sales have exceeded new listings, a situation that cannot be sustained for long! At the end of July there was just 33 properties for sale across Devonport, this is though likely to Improve in the coming months as the Spring market arrives. Traditionally the months of September, October and November are the busiest of the year. For those thinking of selling, a lot more thought and analysis needs to be applied to the process. The property market has changed significantly over the past year as it has moved from a sellers’ market to more of a buyers’ market. It is now more important than ever to maximise marketing impact of the selling campaign order to attract and engage the right buyers. There are keen buyers out there who are looking for the right house, however they are cautious and selective. Property sales in the 3 months to July totalled 54, down just 4% compared to a year ago. Within the mix of these transactions the sales of family homes continues strongly with 45 transactions representing a rise year-on-year of 11%. The median sales price overall for the 3 months to July was down 6% at $1,482,500. This segment of the property market is experiencing the most activity, remaining in positive territory with year-on-year growth in sales volumes. In just the past 3 months 45 houses have been sold up 11% on the same time last year. However with just 44 new listings coming onto the market and an inventory of just 23 houses available for sale at the end of the July there is little choice for buyers. The median sales price for all house sales over the past 3 months was exactly $1.7million down just 1% when compared to the same time a year ago. As has been commented on in prior months, the market for investment and owner-occupied units continues subdued, with just 4 sales in the past 3 months down 61%. As sales remain at this subdued level (and with a limited supply of new listings) the median price remains fairly static. In the 3 months to July median price for those sales was $745,000 down 4% compared to prior year. The month of June will be remembered for the extreme shortage of new listings. 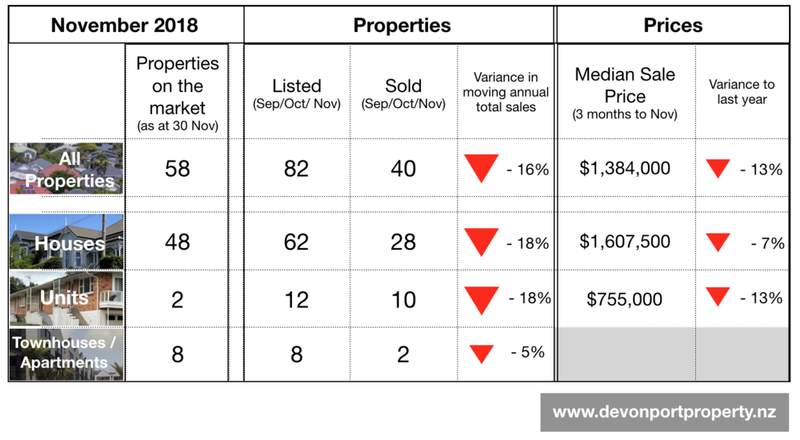 Just 10 properties were placed on the market for sale across the Devonport peninsula in the month, down from 26 in May and compared to the November peak of 32 properties. This shortage of new stock is facing off against a steady pace of sales; which for the past 3 months showed no change from a year ago with 50 transactions in the 3 months to June. This situation of very low listings and robust sales has depleted the available selection for the active buyers, who are still very much evident in the market. This saw the month open with 49 properties available for sale, and 4 weeks later that number had fallen to just 35. The median sales price over the past 3 months is down 2%, reflecting the underlying trend of property prices across the wider region which is best described as subdued. The median price of all property sales over the past 3 months was $1,485,000. Total house sales of 39 in the 3 months to June was up 19%. The median sales price of these houses was $1,750,000 down 4% when compared to the same time a year ago. This fall in the median price is just the 5th time in the past 5 years that house prices have adjusted downwards, however this is consistent with the broader reports for property sale price across the North Shore and Auckland more generally. The key driver of the market for investment and owner-occupied units in Devonport is the rate of sales. Just 3 sales have been recorded in the 3 months to June down a whopping 65%. The past 12 months has seen just 15 sales of units compares to a total of 43 sales this time last year. The impact of these declining sales has seen the median sales price slip 15% when compared to a year ago falling from $827,500 to the latest 3 months at just $700,000. Please note however that such low level of sales can significantly effect median prices. The most recent 12 month median sales price of units was $780,000. The Devonport property market enters Winter after what could best be described as an active Autumn. The trend for property sales remains steady with 59 sales concluded in the 3 months to May. Tracked over the past 12 months the total of sales at 202 is exactly the same as May last year. The median sale price is up, reflecting the demand in the market with an 11% rise to $1.75m. This places the local market in line or slightly ahead of the wider Auckland market where sales volumes have started to pick up but where median prices remains fairly static. This reinforces the view that Devonport remains a suburb in demand with a steady pool of active buyers. The available inventory of properties on the market rose slightly in May to end the month at 49, an increase of 7 properties from April. This was largely the result of a higher level of new listings coming onto the market, 74 new listings in the past 3 months. This is encouraging for those buyers out there, as it offers greater choice, something the market has been lacking for the past few months. However the seasonal trend is to see fewer new listings over the Winter months, so it will be interesting to see how the levels of available inventory levels look as we emerge from the Winter months and hit the Spring market. The median sales price for house sales over the past 3 months topped $1.9m representing a rise of 9% year-on-year. Sales volume for the 3 months totalled 47 which represent a significant increase of 16% when seen as a moving annual total of house sales as compared to the same time last year. A strong rise in new listings added to the available selection across all price ranges resulting in a total of 39 houses for sale at the end of May. The market for investment and owner-occupied units remains subdued. The level of activity is sparse with just 7 new listings coming onto the market in the past 3 months and just 5 sales. This time last year there were 17 sales. This slower market is having a consequential impact on the median sales price which remains static for the fourth consecutive month at $780,0000, down 7% on the same period last year. With just 5 units on the market for sale at the end of May heading into the winter months it is not likely that the market will bounce back anytime soon.